From Hot Dogs to Whole Hogs – We’ve Got You Covered! The selections included in this menu are some of our favorite items for Catering, but remember that your menu can be customized to meet your needs. We would like to confirm your function date 2 weeks in advance and the final meal count 1 week prior to your event. Full Service Caterings: set up on buffet tables with our trained staff serving your guests. Delivery & Set-ups: Our trained staff brings your food and sets everything up – simple & stress free. Gratuity is not included with the prices. 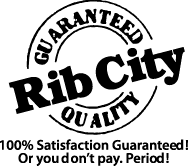 We appreciate you considering RIB CITY to cater your event and THANK YOU for giving us the opportunity to serve you! Pick your favorites – Ribs, Chicken, Pork & Beef – all smoked slowly with our special BBQ Sauce. Slowly cooked to perfection, so the meat just falls off the bone (no knives needed here)! Our plump Chicken is smoked with choice hardwoods that lock in that wonderful barbecue taste! All of the above catering entrees are served with a Dinner Roll & Butter and your choice of two: housemade Cole Slaw & BBQ Beans OR Southern Green Beans. PLUS all plasticware, paper goods and BBQ Sauce. Delivery charges listed below are extra. 3 hour shift $95.00 – Your guests will love the show! One server can handle up to 50 guests buffet style. Our Employee(s) need about 30 minutes to set-up, will replenish food and stay to clean up the buffet table(s). Includes dropping off the catering items to your off-site location, within a 20 mile radius, not inclusive of tolls. Plus organizing and placing all catering items on your buffet table. Above Catering prices do not include local sales tax, delivery, set-up or service charges. This catering menu and pricing is valid for all Rib City locations in Florida, Colorado, Ohio, Missouri, Tennessee and Virginia.